European Commission President Jose Manuel Barroso made a preemptive strike and went ahead of France and Germany in making proposals for a common approach toward bank recapitalisation and enhanced euro area governance. Both countries, who are informal leaders of the eurozone, announced their intention to propose drastic measures to tackle the crisis but did not elaborate. The European Commission president decided to attack by calling things by their real names, although with more than a year delay. He presented the so-called "Roadmap to stability and growth", which aims to bring together all the measures that the EU must apply to successfully come out of the crisis. Part of Barroso's plan is a common strategy for recapitalisation of all banks of systemic importance, taking into account their exposure to sovereign debt. The Commission suggests these to be required to maintain a temporary significantly higher capital ratio, similar to that under the Basel III agreement. The text does not specify any parameters but, according to Basel ІІІ, by 2015 banks should have 7 percent capital adequacy. Obviously, however, the Commission president wants these requirements to be applied immediately to systemically important banks. As German Chancellor Angela Merkel has already explained, banks that need additional capital must first try and raise it themselves from private sources. If they fail, national governments should intervene and only then recapitalisation could be done with money from the rescue fund EFSF. In parallel, the Commission president calls the Financial Transaction Tax to be quickly adopted at European level, while the EU will continue to push for its global implementation. In fact, Jose Manuel Barroso demonstrated great ambitions, while 'digging up the hatchet' in terms of EU economic governance, especially in the euro area. The Commission President calls for rapid implementation of the economic governance package recently approved by the European Parliament and the Council. But he did not stop there. According to Mr Barroso, "the further reinforcement of the role of the commissioner responsible for economic and monetary affairs will also be considered" with regard to the eurozone, and the Commission "intends to work towards a single, coherent framework for better economic governance on the basis of the Community method." The groups of Socialists and Democrats, Liberals and Greens in the European Parliament have been insisting this commissioner exactly to take over the governance of the euro area, rather than ‘the government’ as proposed by France and Germany. According to both countries it should be composed of the eurozone Member States' leaders and headed by European Council President Herman Van Rompuy. Without commenting directly on the subject, Barroso said: "In keeping with stronger internal governance of the euro area there is a need to move towards more unified external representation for the euro area," promising the Commission to propose how to achieve this. This is something he said for the first time in his annual "State of the Union" address in the European Parliament two weeks ago. However, it is clear that the Commission does not intend to leave control in the hands of the Member States and we are yet to witness heated debates in this regard. In addition to his commitment to the community approach, Mr Barroso said that the Euro Plus Pact must be integrated in the procedures of the European Semester. The Pact is another idea of Germany, supported by France. It has been introduced at an intergovernmental level as a clear political commitment of the Member States that joined it (23 EU countries, including Bulgaria). At this stage, however, they are making quite nebulous commitments, which have not been supported by concrete measures. But if the Pact is included in the European Semester, the Commission will monitor how the countries are implementing their commitments, the same way it now evaluates the budgets and other programme documents. Obviously, Greece is again an example of how European controls prove to be insufficient, even when a country is virtually bankrupt and entirely depending on external financing. 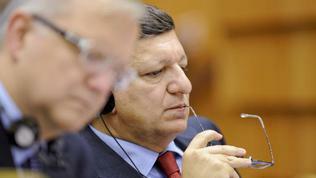 In this regard, Jose Manuel Barroso proposes strengthening of the economic and budgetary surveillance of euro area Member States, requesting or receiving financial assistance from the temporary rescue fund EFSF, the permanent European Stability Mechanism (ESM), the IMF or other international financial institutions. As regards the euro area countries in excessive deficit procedure or under programmes, President Barroso suggests the Commission or the Council to be enabled to intervene directly in their budgetary procedures, "for example to examine national draft budgets ex-ante, to request a second reading in serious cases, to suggest amendments in the course of the year and to monitor budgetary execution." The Commission will present a concrete proposal in this direction. 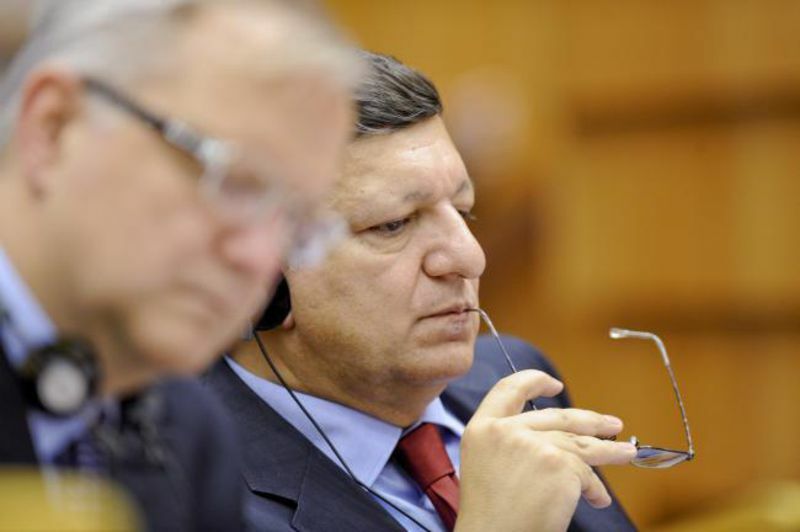 Jose Manuel Barroso pledges by the end of the year the Commission to publish a Green Paper on the options for the introduction of Eurobonds, which he calls "stability bonds." In parallel, next week the Commission will launch the Europe 2020 Project Bond Initiative as a new instrument for European funding under the Europe 2020 strategy. The initiative will be developed in the Commission's proposal for the Connecting Europe Facility, under the next Multi-annual financial framework (MFF). The "dessert" in Barroso's proposal is, as it should be, in the last paragraph: "Finally, it may be appropriate to enshrine some or all of these steps in the formal framework of a Treaty revision." According to the Commission president, "treaty changes could be envisaged to consolidate and give even greater impact to the new Community architecture that is now being put in place via secondary legislation. Treaty change may also be helpful to ensure the coherence of deeper integration within the euro area, with the Union as a whole, in particular the Single Market." Given the frequent statements by German Chancellor Angela Merkel that the treaty changes should not be a taboo for the EU, Barroso's statement is a clear sign - the Lisbon Treaty will soon be called something else. It is true that the European concept of "soon" is a relative term, but given the speed at which the crisis is unfolding, and the apparent lag of a European response, this time "soon" could be surprisingly fast. Especially if Europe has learnt from the mistake of refusing to recognise its problems, let alone seeking solutions. As I said in the beginning, it took the EU a year and a half to recognise that there is a problem with the banks because of the sovereign debt, and that important decisions cannot be made by two member states, simply because nobody else wants to do it. The time has come for a change. The question is how member states would react if these changes are to give more rights to Brussels in such sensitive areas as budget and economy. It certainly would not be easy, but even more certain is that the current cat and mouse game between the community and intergovernmental approach cannot go on. Allow banks go bust and let the market work...! The core problem of the current situation now and then are the stinky assets in the balance sheets of banks. The argumentation goes that many banks are systemic and finally, given the bank goes bust, the real sector is cut off from access to credit to finance its investments and projects. Now we can discuss in length how to preserve the stinky assets to default, but no matter how high the bail-outs of the EU and its member states will be, it will never ever be enough to cover the whole sum neccessary to cover all the losses resulting from these stinky assets. the current system does nothing else but buying time. So, why throwing the money to those financial institutions who have made bad or desastrous investment decissions, why subventionising their bankrupt business model with tax payers money. And why punishing those banks not or not by this amount engaged in such assets? Instead, these billions of Euros should be used and invested into those banks who are operating fine and enable them to provide the financing of the real sector in case a so-called systemic bank goes bust. If there is no bank available for that, set up a system (or a bank) that provides the real sector with the money needed to realise their investments and capitalise it with tax payers money. In any case, the investment banking sector would be isolated from the real economy, the effects of a faillure of a systemic bank would be much lower, and the market would dicide who‘s business modell will survice.